I was aimlessly surfing around Youtube this morning and came across this film. It's from 1934, and purports to tell the story about the most powerful banking family in the known universe -- the Rothschild's. If you've ever listened to Alex Jones's INFOWARS show, or have ever even stumbled upon any conspiracy-oriented website, then you're probably already familiar with the name. The House of Rothschild has existed for hundreds of years, and many claim that the banking family have been secretly controlling the world from their secret hideouts in parts unknown. The Rothschild family has been blamed for everything from the Civil War to the current push for global warming legislation. Presumably, this influence comes from their stranglehold on the global banking system. In short, the Rothschild's control the world, and there's nothing you can do about it. Is this true? Did one family, quietly amassing power and wealth and passing it from generation to generation, manage to grab the steering wheel to the planet and steer all nations, all men in whatever direction benefited them the most? I don't know, but I love a good story. Apart from some slow sections, this movie is actually quite entertaining. 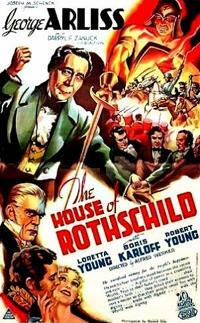 George Arliss stars (in dual roles) as Mayer Amschel Rothschild and his oldest son Nathan. The film follows the family from their days in Jewish ghettos, to their rise to power as the leaders of an insanely rich banking cartel with branches all over the world. Of course, you can't have a film like this without a villain, and here that role is filled by the great Boris Karloff. Karloff plays Count Ledrantz, a powerful businessman who takes great delight in being antisemitic and trying to destroy Nathan Rothschild. It's a very restrained performance from the horror great. I think people forget the Karloff was more than a nearly mute, undead monster (Frankenstein), and was a very capable actor with a terrific screen presence. For me, he's the main reason for watching "House of Rothschild." Also notable is the final scene, in which the film magically transforms from black-and-white to three-strip Technicolor, a Hollywood first. Also worth mentioning, a scene from this film was used in the antisemitic Nazi propaganda film The Eternal Jew, which was done entirely without producer Daryl Zanuck's permission. Apparently, The House of Rothschild is full of factual errors. I won't go into them here, because the history of this family is much too deep for me to recount accurately. What I can say is that is a little too simplistic, a little too good versus evil to paint truly accurate portrait of this legendary and somewhat notorious family. However, it's a pretty neat curio from another time, and is full of excellent performances, particularly from Karloff and Arliss. It's worth a watch if you're ever in the mood for an old movie that is still (somewhat) relevant today. Just be sure to take The House of Rothschild with a grain of salt. Because it's (for now) in the public domain, the entire film is presented below.